View Gallery The wedding ceremony is a time to celebrate tradition. Whether your roots are Christian, Jewish, Hindu, Buddhist, or non-denominational Villa Siena welcomes you and offers the perfect backdrop for your traditions. Villa Siena is familiar with Unity candles, chuppahs, mundaps and other special parts of traditional ceremonies. This day is one of the most special and memorable in your life, so it is important that your wedding ceremony happens just as you wish. We will do everything possible to make it perfect. Non traditional? For the non-traditionalist, we are happy to work with your unique and individual plan to have a wedding ceremony as distinctive as you are. 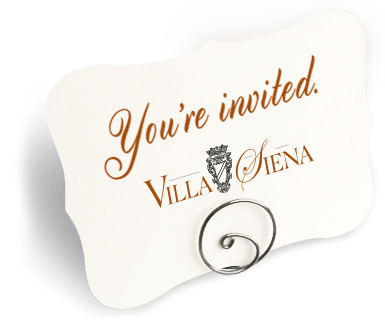 Whether you are celebrating generations of tradition or creating a new one, Villa Siena welcomes you. 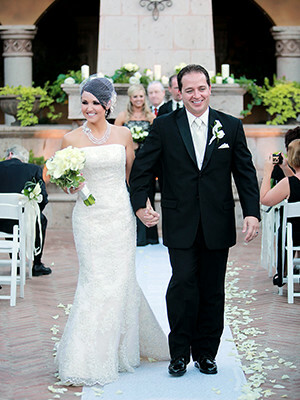 Piazza Toscana offers a picturesque setting for an outdoor garden wedding ceremony. The Piazza is enclosed on all sides, offering complete privacy for the ceremony. Up to 250 guests are welcome to enjoy the ceremony. White wooden padded chairs are set up on the courtyard for guest while a beautiful red carpet paves the way for the bridal party and, of course, the bride. Couples are able to use the stunning freestanding fireplace as a backdrop for their ceremony or face the guests toward the vine covered arch at the other end of the courtyard. 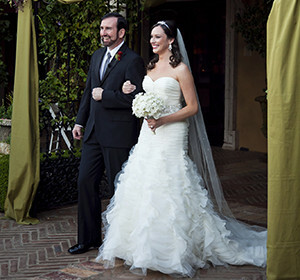 During the summer months, wedding ceremonies are typically held indoors. La Stanza Chianciano provides a lovely indoor setting. La Stanza Chianciano is approximately 2,100 square feet. There is seating for up to 150 guests, a red carpet walkway for the bride and a small cocktail area depending on the number of guests. 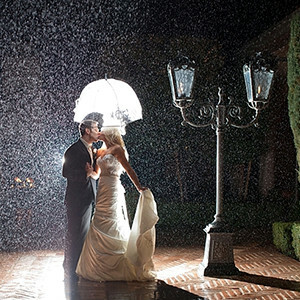 If it rains on the day of your wedding... Not to Worry! On the day of your wedding, if it looks like it might rain, we are able to move your ceremony indoors. If you had planned to have your cocktail hour in La Stanza Chianciano, we are able to move that into La Stanza Pisa. Problem solved! 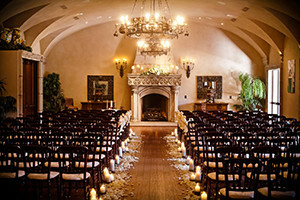 Villa Siena invites you to reserve this lovely space for your wedding ceremony. Intimacy and grandeur are unmatched by any other location in the Phoenix, Arizona area. From the magnificent courtyard with its carved stone columns and gas lanterns to the stunning hand carved stone fireplace in La Stanza Chianciano, Villa Siena’s charm will make dazzling memories. Please join us for a full walk through of the Villa and find out if we are the right private venue for you.